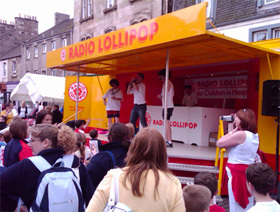 In a number of locations around the world Radio Lollipop run a special RoadShow service. The Radio Lollipop RoadShow is a mobile radio studio and entertainment centre that brings fun and entertainment to any outdoor event. The RoadShow unit comes complete with expert radio presenters and Radio Lollipop Volunteers who provide a central service point for any outdoor entertainment activity. It can act as the central broadcast and entertainment point, provide face painting and hair spraying as well as the famous Lollipop Shop. To enquire if there is a RoadShow unit close to you contact your local Radio Lollipop station.